Coiled tubing (CT) is used for a variety of operations in oil and gas wells, including mill out of bridge plugs after cemented liner plug-and-perf stimulation. With each trip in or out of the wellbore, the CT string incurs a certain amount of fatigue that can be estimated using simulation software based on the CT outside diameter (OD) and material grade. CT units are retired at 80% of predicted fatigue. CT manufacturers have increasing empirical evidence showing that CT units experience premature string failures (below 80% fatigue) in certain areas, such as the Eagle Ford, Haynesville formations and Permian basin in Texas, and the Horn River and Montney formations in northern British Columbia. These string failures manifest in the form of pinholes and parting of the pipe. If these failures occur above ground, safety risks are a major concern. If they occur downhole, as detected by a sudden drop in tubing weight, the project is delayed and the costs of fishing out the broken pipe is incurred as well as the loss of the CT unit for future operations. The CT unit was 2 3/8-in. with 21,000 ft total length, and a capacity of 85 bbl. The total fluid volume in the on-site tanks was 2,500 bbl, with the CT unit pumping 3.5 bbl/min at 7,000 psi. A mixing plant was on-site, which fed the pump truck, and in turn fed the CT unit. When the fluid came back up from the wellbore, it was discharged into a 109 bbl open top tank, which pumped into the first of five fractionation tanks that were connected in series. It was determined that the best place to apply 2K7 WSP would be nearest the discharge into the open top tank. LifeCheck ATP Test Kit software was installed on the CT unit computer and calibrated prior to sampling. A 2 ml sample was taken from the mixing plant and resulted in a count of 9,235 pg/ml ATP. This was equivalent to 6 bottle growth (106) using conventional serial dilution test kits. The water had a distinct odor of bacteria and sulfur. A second test was done using the same standard with 3 ml of sample. The result was 12,010 pg/ml ATP. This was also equivalent to 7 bottle growth (107). Due to the unusually high level of bacteria, it was recommended to shock treat the fluid with 2K7 WSP. This was done by adding four boxes (25 x 1 kg paks per box) of 2K7 WSP to the open water tank. 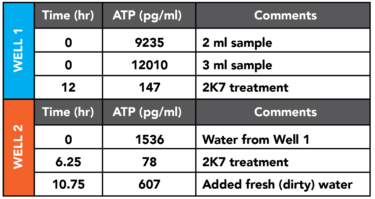 A fluid sample was tested using LifeCheck ATP ~12 hours later and measured at 147 pg/ml ATP. Therefore, the shock treatment with 2K7 WSP successfully reduced the bacterial load. In addition to the reduction in bacteria, Pioneer communicated that circulating pressure was reduced from 7,200 psi to 5,750 psi on average at the same rate of 3.5 bbl/min. Circulating pressure did increase later on, but Pioneer concluded that it was most likely due to increasing chloride and solids within the fluid. OSP suggested that Pioneer monitor with LifeCheck ATP every 2 hours and treat with 1 box every 6-8 hours when the ATP count was >400 pg/ml. The goal was to remain below 500 pg/ml. Pioneer continued to use 2K7 WSP on a second CT mill-out job on the same well pad. The second well used the same water as the first, but it started off at a lower bacterial load due to the previous treatment. A sample tested before offloading the fluid from the truck had 1536 pg/ml ATP. LifeCheck ATP numbers rose when freshwater was added to dilute the solids in the fluid. They treated the 2,800 bbl total volume with 1 box of 2K7 WSP, which brought the numbers down to 78 pg/ml ATP. However, freshwater continued to be added, which with the combination of produced water from the wellbore, brought the numbers back up to 607 pg/ml ATP, indicating the need for continued maintenance treatments. The reduction in bacterial count using 2K7 WSP mitigates MIC, the cause of premature CT string failure. At the completion of each job, prior to CT transport to another job location or storage, treatment with 2K7 Bugstick, a solid stick format, is performed for extended control to preserve the CT steel. Based on this successful trial, Pioneer plans to continue using the combination of OSP’s LifeCheck ATP Test Kit and 2K7 WSP for CT mill-outs and other applications including pre-stimulation toe prep operations. Edillon, L., McLeod, R., Henderson, M.A., McVicar, W., Eyre, K., Pelletier, R., Yao, S., and Yan, J. 2015. Application of a Biocide Water Treatment Program to Prevent Coiled Tubing Corrosion: A Case Study. Paper SPE 173675 presented at the SPE/ICoTA Coiled Tubing and Well Intervention Conference & Exhibition held in The Woodlands, Texas, USA, 24-25 March. Larsen, J., Holmkvist, L., Sorense, K., Skovhus, T.L. 2011 Identification and Quantification of Microorganisms Involved in Downhole MIC in a Dan Oil Producing Well. NACE 11223. Sherman, S., Brownlee, D., Kakadjian, S. 2014. Microbial-Influenced-Corrosion-Related Coiled-Tubing Failures and Equipment Damage. Paper SPE 173658 presented at the SPE/ICoTA Coiled Tubing and Well Intervention Conference and Exhibition held in The Woodlands, Texas, USA, 24-25 March.